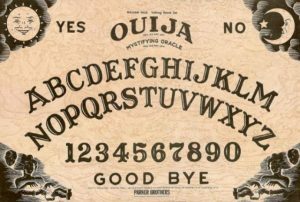 Ouija boards – they’re mysterious, mystical and a tad intimidating. Even the most experienced intuitive may be nervous at the idea of using one, and rightfully so. It is not something to be taken lightly and should be used with the utmost care and responsibility. But fears aside, the Ouija board is an extremely powerful tool, and when used correctly, can help you connect with the afterlife. 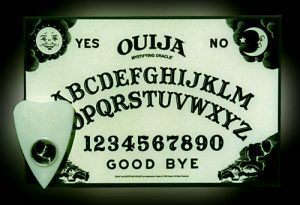 The Ouija board, also referred to as a Spirit Board, has been around since ancient times. It was used for automatic writing in China about 1000 years ago. This device is a board with letters and yes/no words. To help you communicate, a pointer is used to slide to the letters to help you form words and sentences. People use this device to connect to entities in the spiritual realm. Whether you are using the spirit board alone, or in a group, it’s important that everyone be in the right frame of mind. The board activates based on the energy of the people who are using it. If you are scared, angry, fearful or possessive, then you could very well call in that same energy. Always take the time to ground and center yourself before every reading, and ask that only the highest divine energy come through. As mentioned earlier, the Ouija board is a very powerful tool. This means that you should handle this tool, much the same way you would handle driving a car. You certainly wouldn’t, or shouldn’t drive around recklessly, without giving any thought to what’s happening around you. You should exercise that same caution when using a spirit board. Here are some must have rules to live by. If you’re taking this seriously, as an intuitive, always ground yourself before each use of the board. Sit in meditation, and make sure you are present. Surround yourself with the white light of the Holy Spirit. This ensures that you will be protected from any negative energy. The moment you sense a negative entity, end your use of the Ouija board at once. If you want serious answers from the deceased, then you should be respectful of their time and energy. Remember, they don’t have to talk to you, and yet they have taken time out of their day to engage with you. So talk to them, like you would talk to any other person that you admire or respect. Because you don’t see the entity in front of you, it can be easy to just pack up the board and call it a day. But it’s always a good idea to say goodbye so that you can put a closure to everything. Some entities are quite mischievous, and if you don’t give a firm goodbye at the end of your reading, they may stick around longer than they should. If you happen to come across negative energy, the last thing you want to worry about is that energy being in your home. Your home is your personal sanctuary. It’s the place you go to relax and decompress after a hard day. So to keep it calm and peaceful, avoid using the Ouija board at home. Unless you have a high amount of controlled energy, it’s best if you use the Ouija board with a group. It was actually designed for this purpose anyway, as the more positive energy that you have, the better the session will go. This isn’t to suggest that you cant use it alone. It’s just that your results will be better if you don’t. During your session, you will need people to touch the pointer, with one main person controlling it, while another person will simply observe and take notes. It’s always great to have one person who is not attached to the board because the people touching the pointer may be in a bit of trance, and not remember much of what happened. This ensures information is being documented correctly. Everyone should remain quiet and start to tune into the energy of the board. Once an entity has entered, here are some questions that you can ask. What message do you have for me/us? The spirit board is just one of many psychic tools that you have available to you. But never become attached to the board, as this may encourage spirits to become attached to you. If you keep the above tips in mind, you’ll engage in a healthy and productive Ouija board session.